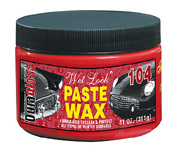 Contains a blend of waxes, polymers and polishing agents. It gives a deep gloss and durable protective coating. Duragloss PW can be used on both regular and clear-coated paint with excellent results. Took a bit of working, but well worth it, the finish and depth of shine is supreme.